Because Chapter 13 is hard to understand in a vacuum, using a hypothetical situation is the best way to show just how much Chapter 13 could help the average family. Below is an example of how Chapter 13 would help “John and Mary Smith,” a young couple how have had trouble making the payments on their debts. John and Mary each earn $36,000 annually. Combined, they earn $72,000. They live in a home with a mortgage, and they are behind on the payments in the amount of $18,000. A sheriff’s foreclosure sale has been scheduled on their home mortgage. John and Mary know that by filing Chapter 13, the foreclosure sale will be stopped, whether the mortgage company likes it or not. They have hired a lawyer who is an expert at drafting Chapter 13 repayment plans. John and Mary’s Chapter 13 plan will address all of their debts, and it will have just about the smallest monthly payment allowed by law. Mortgage: $200,000 with $18,000 in past due payments. The monthly payment is $1,550. Car loan: $15,000 with $550 per month payments that are three months past due. There are three years of payments left on this car loan. John earns $3,000 per month. After taxes and health insurance, John’s net paychecks add up to $2,000 per month. Mary earns $3,000 per month. After taxes, Mary’s net paychecks add up to $2,300 per month. Total net earnings: $4,300 per month. John and Mary’s living expenses total $3,600 per month. Because their net income is $4,300 per month, John and Mary have $700 left over each month to pay toward the debts listed above, in their Chapter 13 plan. In Chapter 13, the law requires that John and Mary continue paying their ongoing monthly mortgage payments. The past due mortgage payments of $18,000 must be paid in full through John and Mary’s five year Chapter 13 plan. John and Mary will no longer pay their $550 per month car loan. Instead, the remaining balance of $15,000 will be paid in full through the chapter 13 plan, with interest, totaling $18,000. John and Mary will no longer make payments on their credit card debts of $60,000. They will also no longer make payments on their student loans of $50,000. Instead, the Chapter 13 plan will pay a small dividend toward the credit card debts and the student loan debts. At the end of John and Mary’s five year Chapter 13 plan, the credit card balances will be discharged, but the student loans will not be discharged, and payments on the student loans will resume. John and Mary’s net monthly income is $4,300 and their monthly living expenses are $3,600. Their Chapter 13 plan will propose a monthly payment of $700 per month to the Chapter 13 trustee (the trustee is a court appointee with a large caseload). This will be a total of $42,000 in payments to the trustee. 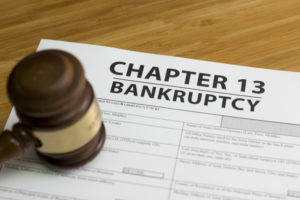 Once John and Mary file their Chapter 13 case in bankruptcy court, they are protected from any creditor collection actions. The mortgage foreclosure is stopped, they get to keep their car, and the credit card banks and student loan lenders cannot do anything to collect either. This protection continues during the entire five year plan. At the end of the plan, all of John and Mary’s credit card debts are discharged. However, the student loans are not discharged unless an “undue hardship” proceeding is filed, which is not possible except in unusual circumstances. Best of all, the mortgage has been brought fully current, and the car loan has been completely paid off as well. The end result of John and Mary’s completion of payments under their Chapter 13 plan is that there is no more danger of foreclosure, they own their car free and clear, and their credit card debts have been discharged. While your situation may not be exactly same as John and Mary’s situation, your Chapter plan can follow the same general legal guidelines, and it can deliver to you the same general legal results. This could make a serious positive difference in your financial situation. Call our office to find out how chapter 13 could work for you. Image credit: Fotolia, used by permission.